In 2017, the Texas legislature passed House Bill 10, a law that changed how mental health and substance use care is provided through private insurance health plans. This law strengthens existing federal protections to help ensure Texans get the mental health and substance use treatment and services they need. Federal and state parity laws require that if your health plan covers mental health or substance use services, those services must be provided at the same level as other medical services. Parity laws do not, however, require insurance companies to cover mental health or substance use services. If you have an insurance plan (including most private health insurance plans, Medicaid managed care, CHIP, or Federal Employee Health Benefit Plans) that covers mental health and substance use benefits, your plan must provide those services at parity. 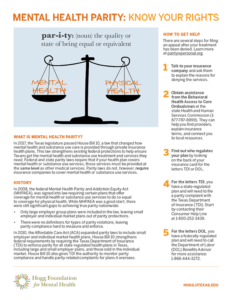 Parity protects your right to receive mental health services and substance use services in the same way that you receive physical health services. We know that parity is a complex topic and that insurance terms can be confusing. 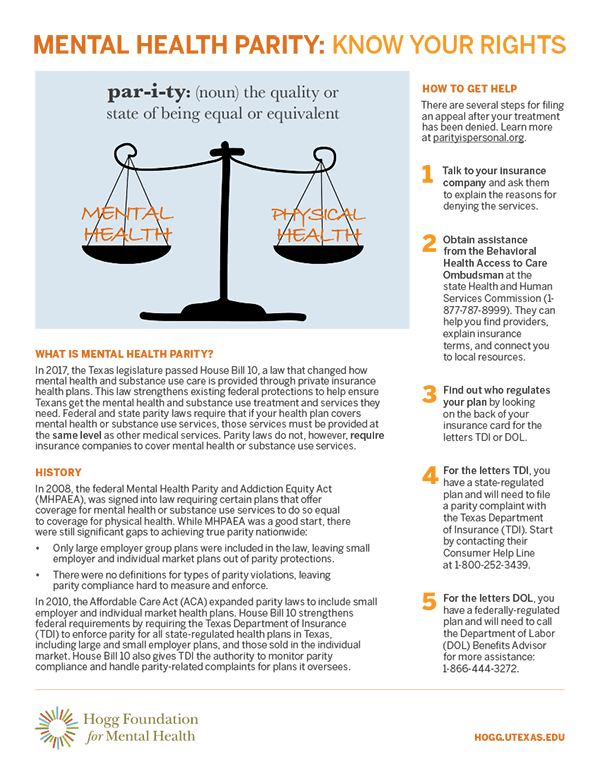 To help, we created a fact sheet with information about how parity works and what you can do if you believe you or a loved one has experienced a parity violation.